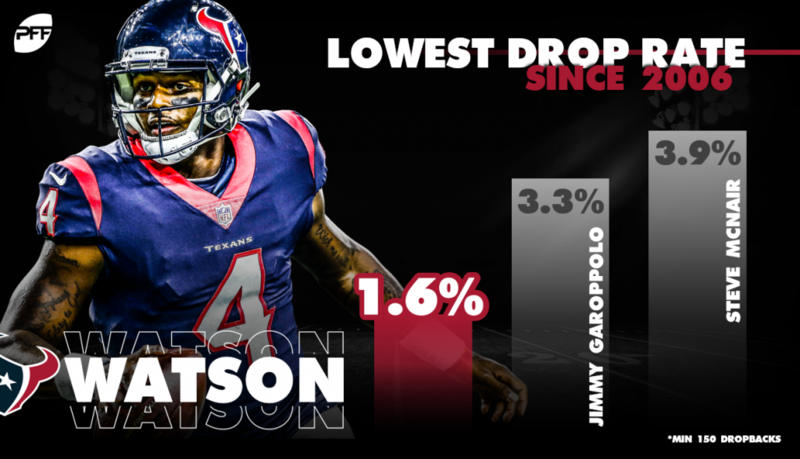 The 32 Observations series continues with Nathan Jahnke, PFF’s Director of Analytics, finding an interesting piece of information about all 32 teams after 10 weeks of football. If you would like to make some observations of your own, you can do so with PFF Elite, where you can find several signature statistics for every offensive and defensive position in football, thanks to Premium Stats 2.0. Buffalo Bills: Only six linebackers have four or more pass breakups this season. The Bills have two of them in Tremaine Edmunds (5) and Matt Milano (4). Miami Dolphins: Over the last two seasons, Vincent Taylor has a run stop percentage of 12.5% which is third-best for all interior defenders. 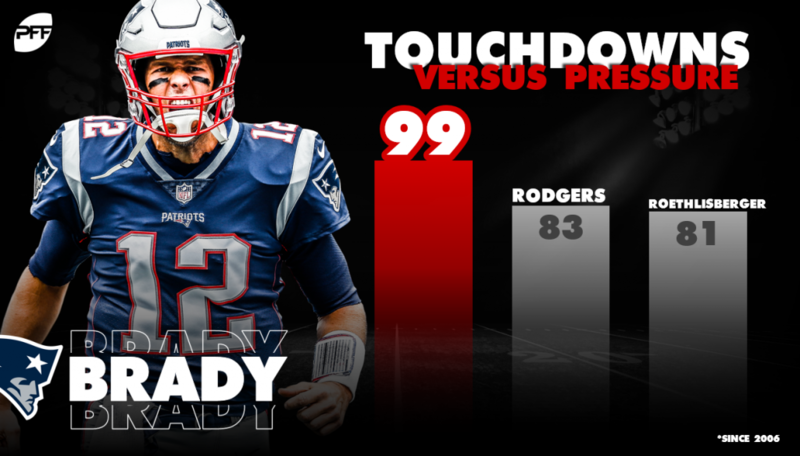 New England Patriots: Since the start of the 2006 season, Tom Brady has thrown 99 passing touchdowns against pressure. The next most for a quarterback is 83. New York Jets: Jason Myers made a 55-yard field goal on Sunday. It was his fifth straight successful kick of 55 or more yards, which is currently the longest streak for kickers. Baltimore Ravens: Za’Darius Smith has produced 16 quarterback pressures on third down, which is tied for third-most among all edge defenders. Cincinnati Bengals: Tyler Boyd has 2.12 yards per route run from the slot, which is third-most for slot receivers with at least 200 slot routes. Cleveland Browns: The Browns interior offensive line has allowed 26 pressures this season, which is the fewest for any team. Pittsburgh Steelers: Even though JuJu Smith-Schuster only has two touchdowns in the red zone, he has been targeted on one-third of his red-zone routes – the second-highest rate among receivers. Houston Texans: Just eight of Deshaun Watson‘s career passes have been dropped. That is only 1.6% of his pass attempts, which is the lowest for any QB with 150+ dropbacks since 2006. Indianapolis Colts: Anthony Castonzo has gone 400 straight pass blocks without allowing a sack, which is the longest active streak for left tackles. Jacksonville Jaguars: Over the last two regular seasons combined, Jacksonville has allowed 234 passing first downs, which is 33 fewer than the next closest team. Tennessee Titans: Titans cornerbacks have missed a combined six tackles in coverage, which is tied for second-fewest for all teams. Denver Broncos: In the last calendar year, Matt Paradis has allowed one sack, four hits and five hurries over 618 pass blocks. All told, he’s allowed pressure on just 1.62% of pass blocks – the second-best mark for centers. 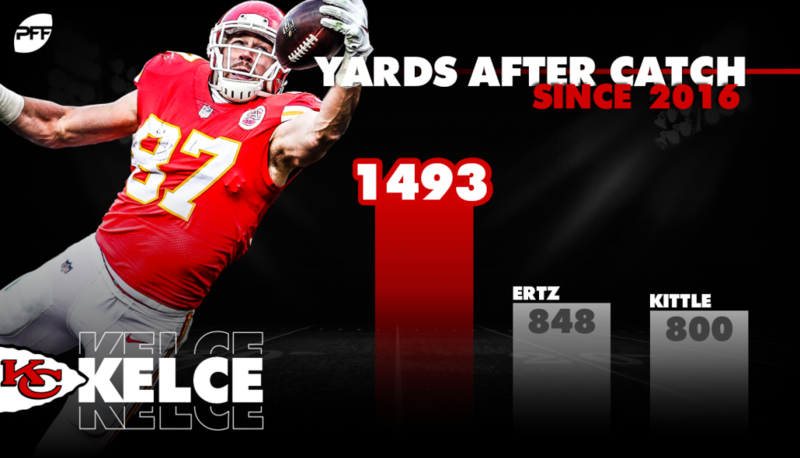 Kansas City Chiefs: Over the last three seasons combined, Travis Kelce has 1493 yards after the catch. That is 645 more than any other tight end. Los Angeles Chargers: Philip Rivers is averaging 11.8 yards per attempt on play-action passes this year. That is the second-best single-season rate for a quarterback since 2012. Oakland Raiders: Gareon Conley has been thrown at six times on third down, and all six passes have fallen incomplete. He is the only cornerback in the league (min. two targets) who has a 100% success rate on third down. Dallas Cowboys: Tyron Smith has gone 91 straight pass blocks without allowing a pressure, which is the longest active streak for left tackles. New York Giants: When B.W. Webb lines up in the slot; he’s been thrown at just 13 times on 142 coverage snaps. He’s the only slot cornerback with 100 or more slot coverage snaps to be thrown at less than 10% of the time. Philadelphia Eagles: Over the last two regular seasons combined, the Eagles players have 586 pressures. That is 77 more than the next closest team. Washington: Josh Harvey-Clemons has been thrown at 21 times this season. Nine of those passes have fallen incomplete, and on another four he was able to make a stop on the receiver. That 61.9% success rate is the best among linebackers this season. Chicago Bears: There are 17 safeties this season with three or more pass breakups. Only two teams have two safeties on the list. The Bears are one of those, as Eddie Jackson and Adrian Amos Jr. both have three each. Detroit Lions: The Lions defense has missed 41 tackles this season, which is the fewest for any defense. Green Bay Packers: In his career, Jamaal Williams has been tackled for a loss on just 5.3% of his carries, which is the lowest for any back with 200 or more carries over the last three seasons. Minnesota Vikings: Sheldon Richardson has gotten pressure on 18.8% of his third-down pass rushes, which is third-best among all interior defenders. Atlanta Falcons: On third downs, Matt Ryan has an adjusted completion percentage of 82.1% which is the third-best rate for quarterbacks in the last 13 seasons. Carolina Panthers: Greg Olsen has caught 69 straight passes without a drop. That is 15 more than any other tight end. 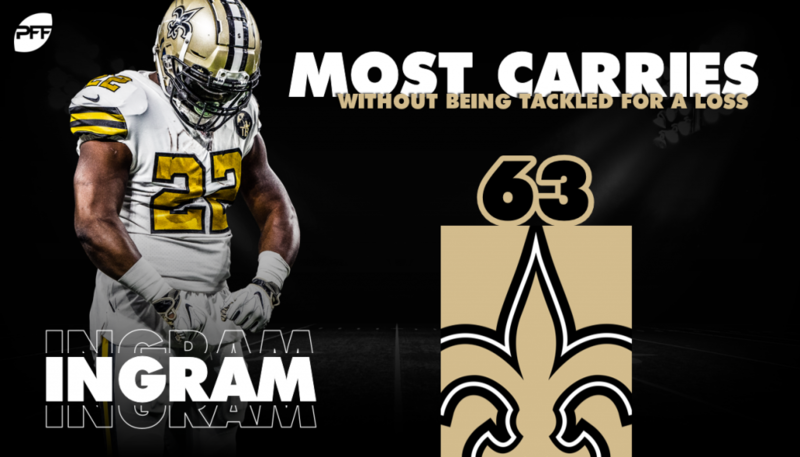 New Orleans Saints: Mark Ingram II has yet to be tackled for a loss. He’s the only running back with 30 or more carries to achieve this. Tampa Bay Buccaneers: The Buccaneers’ wide receivers have caught 118 first downs this season, which is the most among the league’s 32 receiving corps. Arizona Cardinals: Over the last two seasons combined, Markus Golden has a run stop percentage of 12.4% which is fourth-best for all edge defenders. Los Angeles Rams: Aaron Donald has produced six or more pressures in each of his last five games. No other defensive player has six or more pressures in each of their last two games. San Francisco 49ers: Kyle Juszczyk has 425 snaps this season, which is 210 more than the next fullback. Barring injury, this will be the third consecutive season where Juszczyk leads all fullbacks in snaps. Seattle Seahawks: Bobby Wagner has made 71 consecutive tackles or assists without missing a tackle. That is the longest active streak for linebackers.